"All good loadmasters hail from Tennessee," so said former USAF C-130 pilot Bill Gunkle in a late-night telephone conversation. Bill had called from his home in the Southwest to talk to me about a book I was working on about the C-130 troop carrier squadrons in Vietnam. Being a Tennessean myself, I did not dispute Bill's assertion - he was talking about TSgt Charlie Shaub, a loadmaster who is one of the true heroes of the C-130 world. 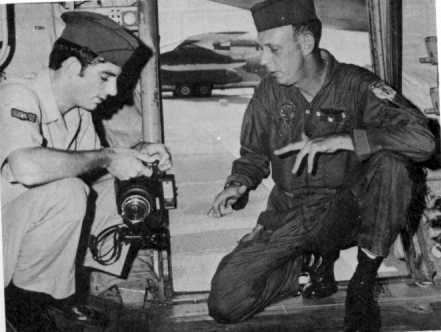 Charlie had been Gunkle's crew loadmaster during an assignment with the 314th Tactical Airlift Wing at CCK Air Base, Taiwan in 1969-70. Charlie Shaub was a Tennessean. He was born and raised near the town of Portland, a town on the Tennessee-Kentucky border north of Nashville. Though his given name was Charlie Shaub, the young boy named himself "Jack Wright" when he was little. His father had deserted the family when he was a baby so Charlie took his mother's maiden name. Though his military friends knew him as Charlie Shaub, his family knows him as Jack Wright. Perhaps due to his lack of a relationship with his father - he never met the man until he was an adult himself - Charlie developed into somewhat of a loner. His favorite activity was reading. He read a lot of books on a variety of subjects but history and the military were his favorite topics. When he grew up, Charlie went into the military, where he found a new home. He trained as a flight traffic specialist, the military version of a flight attendant, in the Military Air Transport Service and flew missions out of Charleston, South Carolina transporting Department of Defense personnel all over the world. In the early 1960s MATS began phasing out it's fleet of C-121 Constellations, the airplanes with which Charlie's squadron at Charleston was equipped, and replacing them with new C-130E turboprop tactical transports. Charlie, along with most of the other male flight attendants, was offered the opportunity to cross-train into the aircraft loadmaster field. He was sent to school at Sheppard AFB, Texas and returned to Charleston to check out as a C-130 loadmaster. He married a woman named Nancy, who was, according to his friends, a "favorite" niece of South Carolina Congressman L. Mendel Rivers, the powerful Chairman of the House Armed Services Committee. But Charlie's marriage to Nancy lasted only two years. His wife developed Hodgkins Disease and died, leaving Charlie alone again. After Nancy's death, Charlie was terribly distraught. He left the Air Force for awhile and took a job with Delta Airlines at the airport in Charleston. But he missed the military life and soon, perhaps with the help of his wife's uncle, Charlie was back in the Air Force. Charlie liked the city of Charleston, but shortly after he returned to the service MATS, which had become the Military Airlift Command, began converting the C-130 and C-124 squadrons at Charleston to the new jet C-141. Several of the C-130 crewmembers, including Charlie, transferred to McGuire AFb, New Jersey. When he got there, Charlie decided he did not like McGuire. He volunteered for an overseas assignment to get away from the base. By this time the Vietnam War was in full swing and qualified loadmasters, especially those in the lower grades, were in demand for duty in airlift squadrons in Vietnam and in the nearby islands of Okinawa, the Philippines, Japan and Taiwan where several squadrons of C-130s were based. Charlie soon got the overseas orders he had volunteered for. He was sent to Ching Chuan Kang Air Base, on the island of Taiwan. The Taiwanese Air Base was home to the 314th Tactical Airlift Wing, a former Tactical Air Command C-130 unit that had been transferred from Sewart AFB, Tennessee to the Far East in the mid-1960s. Charlie soon adapted to his new environment as the former "MATS Weanie" took his place on a combat airlift crew. He enjoyed his time at CCK, and when he went back to Charleston at the end of his tour, he found himself homesick for his overseas base. He volunteered to go back to CCK and returned to the Far East. By the spring of 1972 the Vietnam War was at a low ebb. The 1968 Communist Tet Offensive had given way to a gradual winding down by mid-1969, and after the invasion of Cambodia in May 1970, there was little fighting in South Vietnam. Yet, while the United States was in the process of withdrawing it's forces from a war that was becoming increasingly unpopular with its citizens, the North Vietnamese were rebuilding their forces in preparation for another massive offensive in hopes of overrunning the southern half of the divided country. In April 1972, heavily armed North Vietnamese divisions crossed into the South at several points, including from out of Cambodia as Communist troops began moving south along Highway 13 toward the capitol city of Saigon. NVA troops captured several airfields in Binh Long Province, including the airfields at An Loc and Quan Loi. Communist troops equipped with large-caliber automatic antiaircraft weapons surrounded the town of An Loc, trapping a large South Vietnamese military force inside the city. The only means of delivering supplies was by air, but the large concentrations of antiaircraft guns soon made this a hazardous proposition. At first the Allied commanders attempted to resupply the city by helicopter, but this proved too hazardous. Attempts by South Vietnamese Air Force C-123s also failed, leading the Military Assistance Command, Vietnam to order the United States Air Force to assume the role of resupplying the South Vietnamese troops at An Loc. On the morning of April 15 Charlie Shaub took off in a C-130E flown by a crew from the 776th Tactical Airlift Squadron for an airdrop mission over An Loc. "Spare 617" was the number three airplane in a three-ship drop formation. Commanded by Captain Bill Caldwell, the other crewmembers were Lt. John Hering, copilot, Lt. Richard Lentz, navigator, TSgt Jon Sanders, engineer and SSgt Charlie Shaub and A1C Dave McAleece, loadmasters. They left Tan Son Nhut airfield right at daybreak, and arrived in the vicinity of An Loc after a relatively short flight. The first crew made their drop, though they encountered heavy ground fire. The second airplane aborted when their load would not release and Caldwell's crew became the second C-130 crew to attempt a drop at An Loc. The city was enshrouded by early morning haze, which made seeing the soccer field which was serving as a drop zone very difficult. They were about thirty seconds from the drop zone when heavy enemy fire struck the low-flying Hercules. Hits in the cargo compartment caused the load of Class A explosives - artillery ammunition - to smolder. Machine-gun fire struck the cockpit, wounding the navigator and killing Jon Sanders, who was a close personal friend of Charlie's from their days at Charleston. Shrapnel in the cargo compartment struck Charlie and McAleece. A bleed air line running along the overhead of the cargo compartment ruptured when it was hit, by ground fire; hot engine bleed air spilled into the cargo compartment, increasing the danger of fire and turning the inside of the airplane into an oven. The green light had been turned on so Charlie instinctively released the restraining strap holding the load and set the cargo free. Two of the pallets exploded as they left the airplane but the other landed on the drop zone, a soccer field. The heat from the bleed air made the metal skin of the fire extinguishers too hot to touch, but Charlie used one to fight a fire that broke out in the wheel well area. In spite of his injuries, Shaub managed to put out the fire and save the airplane. He went up into the cockpit to check on the rest of the crew and told the navigator to open the cockpit windows while he removed the overhead escape hatch to clear the smoke. But, they were not out of the woods yet. The crew had shut down both left-hand engines after the fire warning lights illuminated, and there was no hydraulic pressure to lower the landing gear. With his own hands too badly burned to turn the crank, Shaub supervised as McAleece cranked down the gear. They finally extended just as the airplane reached the traffic pattern at Tan Son Nhut. Power on a third engine rolled back momentarily after they entered the landing patter at Tan Son Nhut, but Captain Caldwell managed to get the crippled airplane on the ground. Charlie was deeply saddened by the loss of his friend, Jon Sanders. They had served together back at Charleston and were long-time friends. He had been wounded himself, and his hands were badly burned. In recognition of his actions, Charlie was nominated for the Medal of Honor, the highest decoration that can be bestowed by the United States military. According to some who knew him, Charlie was proud to have been nominated for the prestigious medal, and was disappointed when the award was disapproved. Still, he received the Air Force Cross, the second highest medal presented to US Air Force personnel for heroism. He was also awarded the William H. Pitzenbarger Heroism Award by the Air Force Sergeants Association. (The award was named for a young Air Force pararescueman who had given his life in Vietnam earlier in the war, and who had also been awarded the Air Force Cross, though posthumously. He has since been awarded the Medal of Honor.) Shortly after the mission, Charlie was promoted to the enlisted grade of Technical Sergeant. In 1976 Charlie Shaub retired from the Air Force, and returned to his Tennessee home at Portland. His family was glad to see him home, but they knew little of what he had done that day in South Vietnam. It was not until his death twenty years later when one of Charlie's military buddies told them at the funeral that they understood that "Jack" was a hero. After his retirement from the Air Force, Charlie lived alone. His health deteriorated. Then he fell and broke a hip; after the injury Charlie became essentially an invalid. He moved into a VFW-sponsored retirement home in Gallatin, Tennessee, where he could be in the company of other former military personnel and where someone could keep an eye on him. One day in 1996 he was found dead in his room. Charlie Shaub was a hero of the Vietnam War, and of the C-130 world. His actions during the mission to An Loc set him apart from the rest of us who served as C-130 crewmembers in that long and terrible war. He deserves to be remembered. Note - Spare 617 was delivered to the US Air Force Museum for public display in August 2011.